Results of Assam Higher Secondary Examination 2018 will be published on this page. As per reports, AHSEC Results 2018 will be announced between May 25 and 31. As the dates are still tentative, the final date will published on this page very soon. Please monitor this page for latest update on results. Around 2,60,000 students of Science, Arts and Commerce streams appeared the High Secondary Education examination this year. The practical exams were held from January 5 to January 30, 2018. Flying squads were deployed at 21 centres in the most sensitive areas of Assam. Register to get latest updates on AHSEC Results 2018. Rajababu Saikia of Ramanujan Junior College in Nagaon topped the science stream in 2017. He secured 96.40% marks. Rajababu secured 482/500 in Science stream, while Abinash Kalita (480/500) of Krishnakanta Handique Junior College, Pathsala came second in the Science stream. Alka Das from Krishnaguru College in Barpeta topped in Arts stream by scoring 480 out of 500 with 96% marks. Sabina Yasmin of Brilliant Academy, Mangaldai (478/500) and Ankit Mitra of Genius Academy Junior College, Lakhimpur (474/500) came second and third respectively. Prashanta Goyal of KC Das Commerce College in Guwahati topped the commerce stream by scoring 94.20% marks. 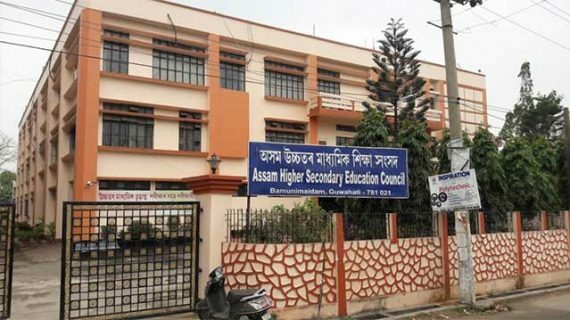 The Assam Higher Secondary Education Council (AHSEC) was established on June 1, 1984 to Regulate, Supervise and Develop the System of Higher Secondary Education (+ 2 stage) in Assam. Dr.Dayananda Borgohain is the Chairman of Assam Higher Secondary Education Council. Kamal Gogoi is Secretary of AHSEC. The AHSEC prescribes curricula and syllabus for Higher Secondary stage which may be taught in a junior college or Higher Secondary school. The curriculum set by the AHSEC is highly dynamic, and a chapter on basics of GST was introduced in the macro economics section of the curriculum for higher secondary second year economics students. It also conducts examination and grant certificate to students passing the examinations. The AHSEC prescribe and select text books and supplementary books for the 10+2 courses and lay down conditions of recognition of Higher Secondary School and Junior College. It also prescribes necessary qualifications of teachers in recognized Higher Secondary Schools. The Council has a full time Chairman who is the chief executive of the organisation. The Chairman is appointed by the state government for a term of three years, which may be extended for another period of three years. The Secretary of the Council is the principal Administrative officer and is responsible for all matters. The Controller of Examinations is responsible for all matters concerning examination administration as well as confidential work of examination. The Assam Higher Secondary Education Council also runs the Assam Open Schools in the state. There are 99 accredited study centres of Assam Open School spread across all the districts in the state. On February 23, 2018, Assam Higher Secondary Examination began across the state. It was conducted by the AHSEC. The examination ended on March 23, 2018. The candidates can expect their council results in May 2018. Usually, the council takes around 50 days to announce the results. Although the officials of Assam Higher Secondary Education Council do not officially release the result date until today, students can expect a bit earlier this time. In this page will update every informations about AHSEC Board Results, 2018.